Ok. I feel like after all this, I’ve got some ‘splainin’ to do. In a couple of previous blog posts, I’ve alluded to the possibility that there may be more on my mind of late than music. And now, I’ve accosted you with…what?!? A LOVE song?! Well, it’s a ridiculously giddy truth. I am in love. I’m also in all the cheesy misspellings of love, including “loooooove,” “luv” and “lubb.” It would be rather embarrassing, I suppose, if I cared much about how silly it seemed. So all I ask is that you bear with me. Because, really…just look at him. Can you blame me? About two years ago, I met this incredibly handsome military officer, and he took me on a stealth date. I laugh about it now, because the quickest way to freak me the hell out when I’m really, truly single, is to tell me you want to take me on a proper date. So, he didn’t. He just asked me on the spur of the moment to meet him for dinner. And he picked up the check. That was when I began to sense his intentions. 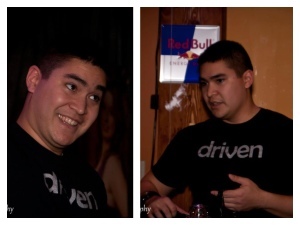 Roughly eighteen months later, Jordan worked like crazy at the Driven release party, selling CDs and t-shirts, generally charming our guests and being referred to, repeatedly, by announcer Michael Gilboe as “man candy.” The pictures above were taken by Erin K Photography that night. In the last few months, though, we’ve had to spend a fair amount of time apart, and given the nature of the military and its propensity for rearranging the location at which you work, we’ll be spending quite a bit more time apart. All with the goal, of course, of getting ourselves situated once again in the *same* location, upon some undiscovered eventuality which admittedly seems at times to be getting further away than closer. Hey, does anybody want to buy a tremendously charming house and help me speed up the process? The end of this summer is a little bittersweet. I spent the good hottest part of it renovating the bathrooms and painting the living room, but I quite like it now. I’ve always been fond of my house–and for eight years, it’s been my home. It has seen me through a divorce, a few interesting journeys through friendship, and a LOT of karaoke practice. (I’m weird like that, okay?!) A million memories have been made here. So, in some ways it’s hard to say goodbye. In other ways…I don’t know how much higher I’ll be able to count after that first million. So, I don’t know exactly when, but I’ll be moving, and looking for a new job, and headquartering danajoforseth.com out of a different state…probably a few different states, honestly…but I hope you’ll keep me in your hearts and on your radar. While I may periodically pause, I don’t plan to quit making music, EVER. In the meantime, I want everybody to know, I’m in good hands. I can tell, Jordan is one of the good ones.